Steve G. Jones, Ed.D., Clinical Hypnotherapist, charges $1,500 for a custom recording and $25,000 for a one-hour private hypnotherapy session at his office. But you can get all the benefits for this low price. Simply listen to the Stop Chocolate Cravings Hypnosis MP3 every night as you go to bed for three weeks and feel the changes happening in your life. You will feel more empowered, more in touch with your true self, and you will truly know that your goals are within your reach. Steve G. Jones achieves AMAZING and LASTING results!!! Hypnosis is the easiest way to affect change in your life because the positive messages go straight to your subconscious mind effortlessly so you can accomplish your goals and reach for the stars!! All you have to do is listen to the Stop Chocolate Cravings Hypnosis MP3 session at night as you go to sleep!!! You’ll hear soft music, the gentle sounds of the beach, and the soothing sound of Steve G. Jones’ voice all working together to bring about positive changes in your life easily and naturally. Steve G. Jones has been helping people improve their lives with hypnosis for over 17 years…now it’s time for him to help YOU… don’t wait, do it NOW !!! you’ll be glad you did. See you at the top! Do you ever get the uncontrollable urge to eat chocolate? We all get cravings for chocolate every now and then. Giving into these cravings occasionally is okay, especially if you go for dark chocolate. Dark chocolate is good for your heart and it contains a lot of antioxidants. However, the downside is that chocolate is high in calories and high in fat, so one serving is all you need. The key to getting rid of your chocolate addiction is to be smart. Yes, you LOVE chocolate. No, you do not have to give up chocolate forever. It is important to think in terms of moderation. Perhaps you will go a week without chocolate, but then you eat a huge piece of cake or several brownies in one sitting. You do not want to deprive yourself because that will only make you want it more. I suggest that you allow yourself to eat chocolate everyday. That’s right, everyday! However, you set a limit to one serving per day. And perhaps you can make it dark chocolate to receive the many healthy benefits. And as you continue relaxing deeper, deeper, and more deeply relaxed, you realize that you do not like chocolate anymore. I want you to imagine now, chocolate in front of you and all its various forms and all the forms you previously liked. See it on the table in front of you. Perhaps it is ice cream or chocolate bars, however it appears in your mind, let it appear now, chocolate in its various forms. I want you to see it as being disgusting, thoroughly disgusting because the truth is chocolate is disgusting. See it putrid and rotting with flies all around it on that table now, chocolate. Even the word chocolate now means disgust to you. When you hear the word chocolate you start to think of disgusting things like that chocolate on the table, that filth, covered with flies. You are no longer interested in chocolate. Chocolate is disgusting, everyone knows that, everyone understands that. Chocolate is disgusting and if they don’t, you are certain to tell them just how you feel about chocolate. Chocolate is disgusting, it is dirty, filthy, vile, gross. It is not something that should be eaten, it’s more like plastic. Rotting, disgusting, it tastes like plastic, rotting disgusting plastic. Chocolate is gross. Chocolate is disgusting. Now, as you look at the chocolate in the various forms on that table, I want you to make it even more disgusting. What could make it even more gross and disgusting? That’s right. Do that to it, that thing which you were thinking which would make it even more disgusting to you, do it to it now. Chocolate, how awful, how putrid, how gross, how disgusting, how vile, how repulsive. You no longer are interested in chocolate. The very smell of it makes you want to put it down, throw it away, cast it far from you. Chocolate smells bad. Chocolate smells gross. Chocolate smells disgusting. It is easy for you to say no to chocolate. It is despicable. Imagine yourself now trying to eat chocolate and as you raise it to your mouth, you have to remember how disgusting it is and you have to put it down and walk away from it because it is absolutely repulsive. It is upsetting to even look at so look away. There is no need to look at chocolate, so ugly and gross. Look away, that’s right. You have now joined the many people that understand that chocolate should be avoided. Chocolate is not food. It looks and feels and tastes like plastic. Except it has a disgusting behavior about it which makes it far worse than plastic. Chocolate is thoroughly disgusting. Push that table full of chocolate away from you now, walk away from it. You are free from the grossness, from the disgustingness that is chocolate. You are free from it so walk away from the table full of chocolate you have just pushed over. Walk away, never to return to chocolate. This powerful Overcome Chocolate Addiction hypnotherapy recording will change your view on chocolate. No longer will you crave or desire chocolate. You see, hypnotherapy can completely change your perception on chocolate, that’s right! Whether you crave chocolate a lot or if you are addicted to chocolate, this Stop Chocolate Cravings Hypnosis MP3 session will help you eat chocolate in moderation. In the past you have probably craved chocolate all the time and when you get in front of a cake or candy bars, you’re uncontrollable. But with hypnosis, you can regain the control. Your subconscious mind will be given powerful suggestions so that you will no longer crave chocolate. Hypnosis targets your subconscious mind so that you feel as though you are in control of your chocolate cravings. You will be able to eat a small amount of chocolate and be satisfied by this small amount. Hypnotherapy also gives you the power to say, “I’ve had enough” when you have had an appropriate amount of chocolate. Your brain will know when to tell you to stop and thus, you will always be in control! 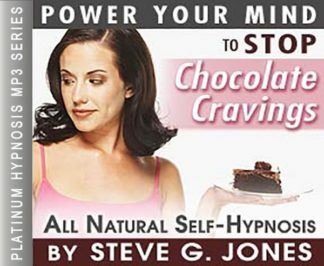 We suggest you listen to this Stop Chocolate Cravings Hypnosis MP3 audio for three weeks in a row at night as you go to bed. Within 21 days, you will no longer crave chocolate to the extent that you used to. You will no when you have had enough and you will be able to turn down chocolate whenever you want. Hypnotherapy is very powerful and it gives you the control you need in order to let go of your chocolate cravings.